Book your one way ticket to Brazil and play the impressive 100-line free Samba de Frutas slot machine by IGT! Brazil is an incredible country put on full display in the FIFA 2014 World Cup. It's rich in culture, the country is a natural wonder and it has deep African roots and influence. In fact, it was the African influenced Samba dancing that was the inspiration for this exciting new IGT slots game! Book your one way ticket to Brazil and play the impressive 100-line free Samba de Frutas slot machine by IGT! Brazil is an incredible country put on full display in the FIFA 2014 World Cup. It’s rich in culture, the country is a natural wonder and it has deep African roots and influence. In fact, it was the African influenced Samba dancing that was the inspiration for this exciting new IGT slots game! We have to say, this game feels unlike anything we’ve ever played before… and it’s wonderful! 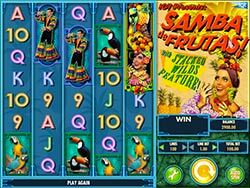 Samba de Frutas is a 5-reel video slot boasting 8-rows to offer its 100-paylines. One look at this slot and you know that IGT’s foray into the online slots world is a success and that they’re fully committed to becoming the best. The graphics are stunning and the music is a catchy. On the reels you’ll find Samba dancers of course, maracas, toucans, fruit cocktails, parrots and card symbols from 9 through Ace. The features are few but great, including a Stacked Wild (these can be a full 8 symbols high!) and Free Spins scatters. The best part of this slot’s rewards is that in a single spin, you could win up to 25,000,000 coins! Stacked Wilds – The Fruits are the Wild in this game and appear stacked. Remember, there are 8 rows in this slot so the Stacked Wild fruit can be an incredible 8-rows high as well. Carmen Miranda, eat your heart out! Maraca Scatters – The painted wooden maracas are the game’s Bonus Symbols. If you can get 3 of these on the center three reel’s, reels 2, 3 and 4, you’ll win 2x your total bet and trigger 5 Free Spins!